I loved Stray, the first book in this series, and I was far from disappointed with Rogue. I would really recommend reading this series in order & although there won't be spoilers for Rogue in this review I can't help but give away some things that happen in Stray. If you've not started this series yet then I suggest you don't read any further. The story continues several months after the end of Stray and as she promised her father Faythe is now working as an enforcer alongside Marc, who she is also now dating again. She is still unsure of her long term plans but is enjoying being an enforcer and is determined to prove herslef to her father & the rest of the Pride. It isn't long before strange things start to happen though. The Pride starts to get anonymous phone calls directing them to the bodies of dead strays in their territory. They also discover a pattern of missing human strippers that seems to be linked to the bodies and Faythe is getting threatening phone calls from her ex-boyfriend Andrew. Is it all a coincidence or is everything somehow linked together? 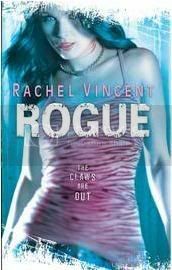 I really enjoyed reading this book, Rachel Vincent has a way of sucking you into the story and making it impossible to leave. Faythe is strong and independant but she can also be selfish and immature. At times I wanted to shake her but the very fact that she has her weaknesses makes her seem more human. None of us are perfect and it can be easier to relate to someone who has such obvious faults. There is also a lot of room for Faythe to grow up throughout the series & I'm looking forward to watching this happen. I love the relationships between the Pride members and it is easy to feel like you know the characters personally. Marc is fantastic & I really have to wonder at Faythe's sanity when she pushes him away, sometimes it is really hard to see why he puts up with some of the things she does. I also really like Faythe's brothers. We didn't really get to see much of Faythe's mother in the previous book but she comes into her own more in this book and you get to see more of her influence on Faythe's character. As with the previous book there are lots of things going on and although I was able to make some guesses about how things were going to tie together there were a lot of things that came as a complete surprise. The book ended on a major cliff hanger & I was just relieved that I already own Pride and was able to start reading it immediately! If you haven't already discovered this series then I can't recommend it strongly enough.